Detoxification is also known as an open circuit or once-through system treatment. It is impossible to detail all potential treatment configurations here, however they all include a number of fundamental functions (figure 64) and make use of oxidation, reduction and neutralisation techniques followed by the precipitation of metal hydroxides and various toxic products (see also coagulation-floculation and chemical precipitations). the various hydroxides that are precipitated can be separated in static settling tanks or in lamellar static settling tanks (see static settling tanks). 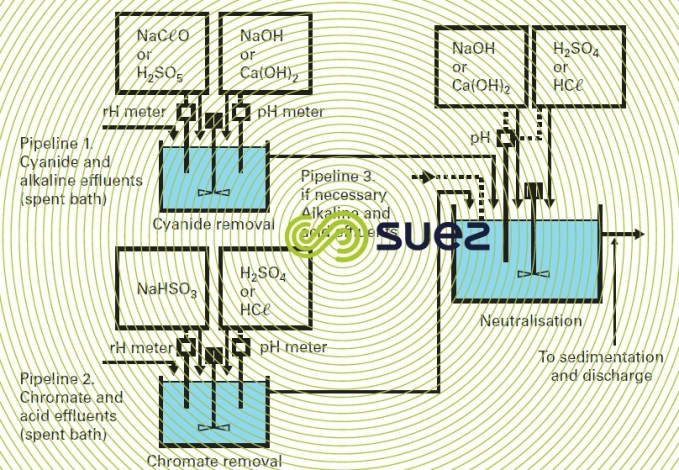 Dewatering of the extracted sludge is often carried out with a filter press.